It is not uncommon for children to eat fast food as families are busier than ever. Families often do not have the opportunity to sit together and share a meal, which hinders healthy food choices for their children. After Robbi Boone from Kings Kids Learning Center in Kentucky participated in the National Early Care and Education Learning Collaborative (ECELC) program, the children at her center now sit together as they enjoy their afternoon meal. During the spring, the children had the opportunity to shuck, prepare and eat corn as a delicious snack. Most of the children had never seen corn on the cob and thought corn came in cans from the grocery store. 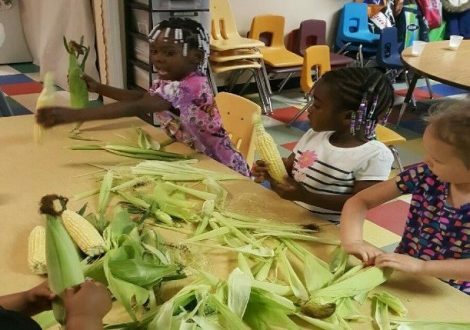 During their snack preparation, the kids learned that corn grows on a farm. They also learned that a farmer planted the corn seeds in the ground and that it grows into a tall stalk. They learned that corn has strings called silks and that the leaves protect the outside of the corn. More importantly, they were given the opportunity to experience what it is like to peel the outer coverings of corn. This experience allowed the children to see the corn, touch the corn, smell the corn and eventually taste the corn. This multi-sensory approach provided the children with a well-rounded experience. The children shared this experience with their families and hope to replicate it at home. For years, Meadowlands YMCA’s mission promoted healthy living, youth development, and social responsibility to the kids at their center. For that reason, it was in director Ellen Daly’s best interest to team with any organization that would help her fulfill her center’s goal of nurturing healthy eaters. It may take a little flexibility and prep work, but time in the kitchen with preschoolers can be educational, boost kids’ confidence and promote healthy eating. Learn how to get started and what are some ideal jobs for preschoolers in the kitchen from this informative article from KidsHealth.